Kicking & Screaming: Cancelled or Renewed for Season Two on FOX? Can even trained survivalists survive network TV? Has the Kicking & Screaming TV show been cancelled or renewed for a second season on FOX? The television vulture is watching for the latest cancellation and renewal news, so this page is the place to track the status of Kicking & Screaming season two. Bookmark it, or subscribe for the latest updates. Remember, the television vulture is watching your shows. Are you? Airing on the FOX television network and hosted by Hannah Simone, Kicking & Screaming is a survivalist reality show competition. 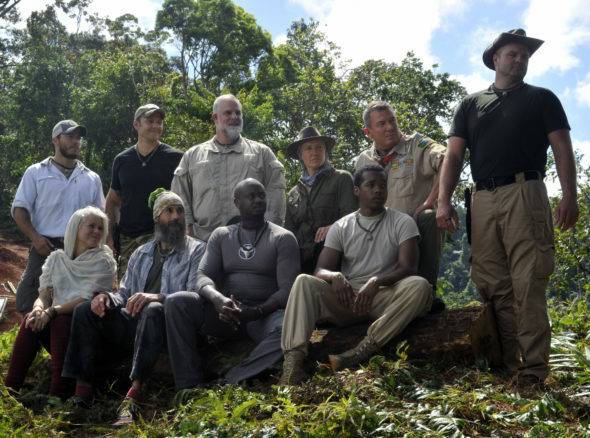 The series teams 10 expert survivalists with “indoorsy” types for “the race of their lives.” In a tropical jungle in Fiji, these mismatched teammates will face dangerous animals, raging rivers, hunger and extreme weather. Although the survivalists can fend for themselves, there are not prepared for their partners, who think “glamping” is roughing it. The first season contestants include a former beauty pageant winner, a model, and a professional gamer. To win the cash prize of $500,000, the experts will have to drag their partners to the finish line. The first season of Kicking & Screaming is averaging a 0.58 rating in the 18-49 demographic and 1.88 million viewers. Find out how Kicking & Screaming stacks up against the other FOX TV shows. As of April 26, 2019, Kicking & Screaming has not been cancelled or renewed for a second season. Stay tuned for further updates. This series debuted to pretty low ratings and the numbers have dropped much lower. I suspect that Kicking & Screaming will be cancelled by FOX with ratings like these. Subscribe for free updates on any Kicking & Screaming cancellation or renewal news. Check the rankings for all of the FOX 2016-17 TV shows. Find more Kicking & Screaming TV series news or other FOX TV show news. What do you think? Will FOX cancel or renew the Kicking & Screaming TV show for season two? How long do you think this new reality series can last? So You Think You Can Dance on FOX: Cancelled or Renewed for Season 16? Beat Shazam: Cancelled or Renewed for Season Three on FOX? Love Connection on FOX: Cancelled or Renewed for Season Three? Brooklyn Nine-Nine: Is the FOX TV Show Cancelled or Renewed for Season Six? LA to Vegas: Is the FOX TV Series Cancelled or Renewed for Season Two? Superhuman: Is the FOX TV Series Cancelled or Renewed for Season Two? The F Word: Cancelled or Renewed for Season Two on FOX? Please renew this show! It was amazing to watch the growth of all the players.